Herbert Brunnegger - THE MASSACRE AT LE PARADIS - HELL IN PARADISE - MAY, 1940. 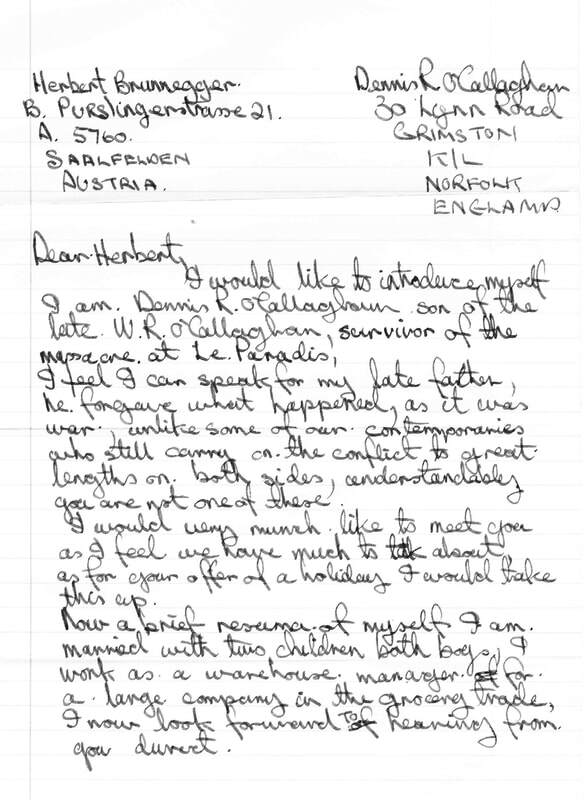 In 1983 Dennis O'Callaghan sent a letter to hotelier Herbert Brunnegger in Austria.. But this was no ordinary correspondence. Herr Brunnegger was the man who photographed the lead-up to the massacre at Le Paradis. 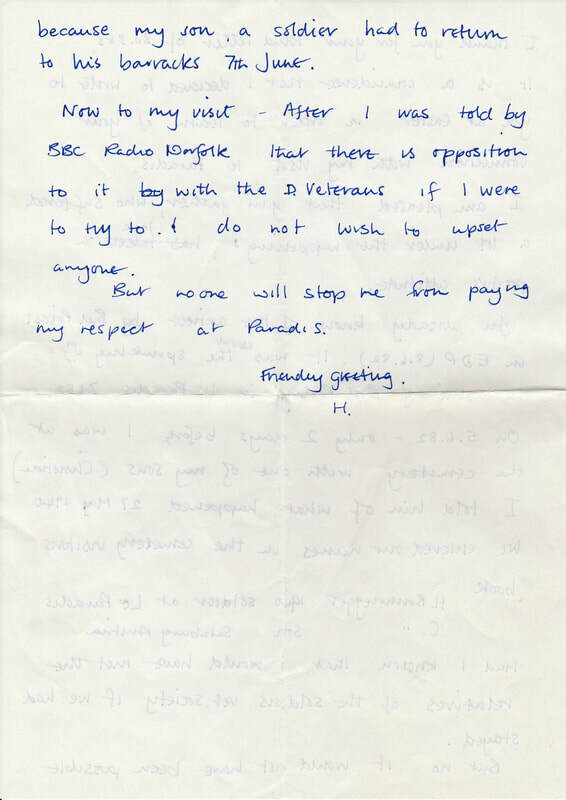 Dennis' letter of conciliation said much about the humanity and views of the O'Callaghan family and the fact that Bill O'Callaghan bore no hard feelings towards Brunnegger, who had been a German soldier. Later that year, Dennis received a reply at his home near King's Lynn, Norfolk, from Herr Brunnegger. 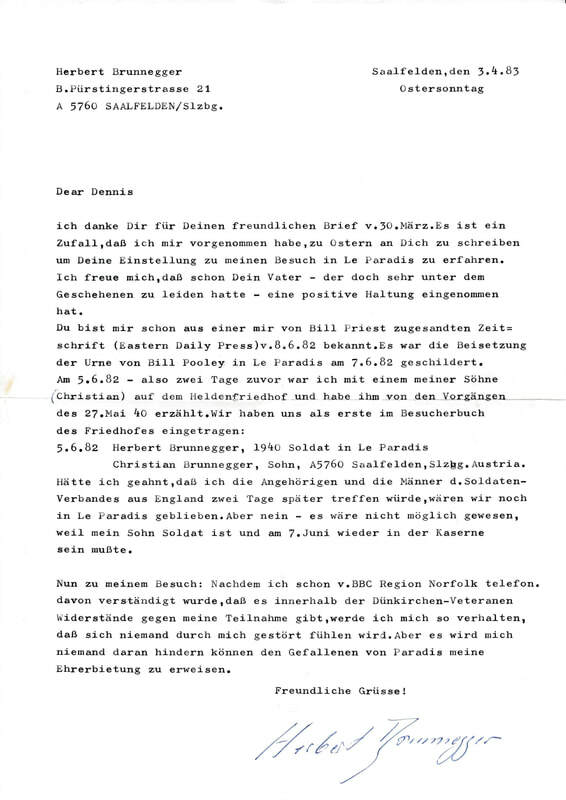 Below we publish Dennis' letter to Herbert Brunnegger (pictured above in his German uniform) and Brunnegger's reply. Below is an English transcription of the letter from Herbert Brunnegger. Click on the pages to increase their size. "I thank you for your kind letter of. 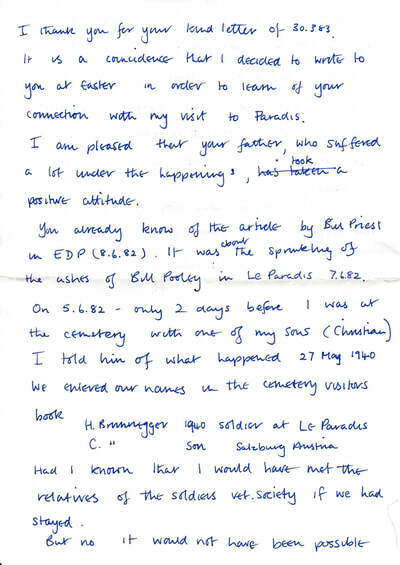 It is a co-incidence that I decided to write to you at Easter in order to learn of your connection with my visit to Paradis. I am pleased that your father, who suffered a lot under the happenings, took a positive attitude. Had I known that I would have met the relatives of the soldiers vet society if we had stayed. But no it would not have been possible because my son, a soldier, had to return to his barracks 7th June. Now to my visit. 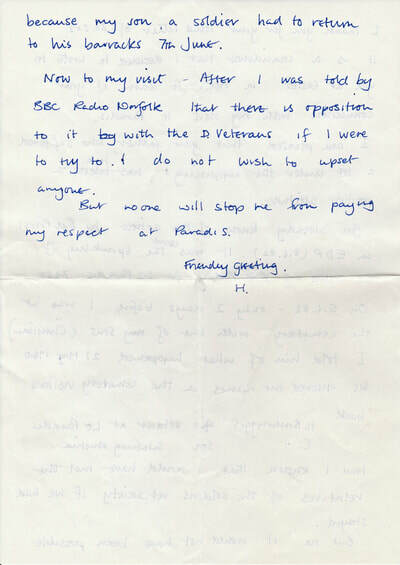 After I was told by Radio Norfolk that there is opposition to it with the D Veterans if I were to try to. I do not want to upset anyone. But no-one will stop me from paying my respect at Paradis. Herbert Brunnegger was a 17-year-old SS soldier who in May 1940 took a photograph of the doomed prisoners of the Royal Norfolks and other regiments being marched to their death outside the barn at Creton's Farm in Le Paradis. Herr Brunnegger later learned just what had happened to the soldiers after he took the photograph and was haunted by what he found out. After the war he took it upon himself to find the two survivors - Privates Bill O'Callaghan and Bert Pooley. He contacted the Commonwealth War Graves Commission with the idea of enlisting their help to trace the two men to offer them a holiday at his hotel in Saalfelden near Salzburg. Sadly by this time both Bill and Bert had died. 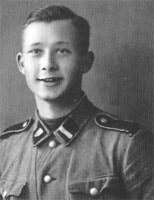 Herbert Brunnegger was the youngest professional soldier in the pre-war German army, having joined the Waffen SS in April, 1938 at the age of 15. After service in Poland he found himself in Northern France. He was separated from his unit while crossing La Bassee Canal near Le Paradis and he came across the Norfolks by chance. Herr Brunnegger later said that he was sent away from the scene before the shootings took place but claims to have seen Fritz Knoechlein later that day shooting at women civilians. He said he felt revulsion when he learnt about what had happened. He admitted to seeing the column of prisoners by the barn with many of them reaching out in despair to him, showing pictures of their families. Herr Brenegger then admits that he saw two machine guns set up in front of the prisoners. On inquiring what the machine guns were to be used for he was told "to shoot the prisoners." 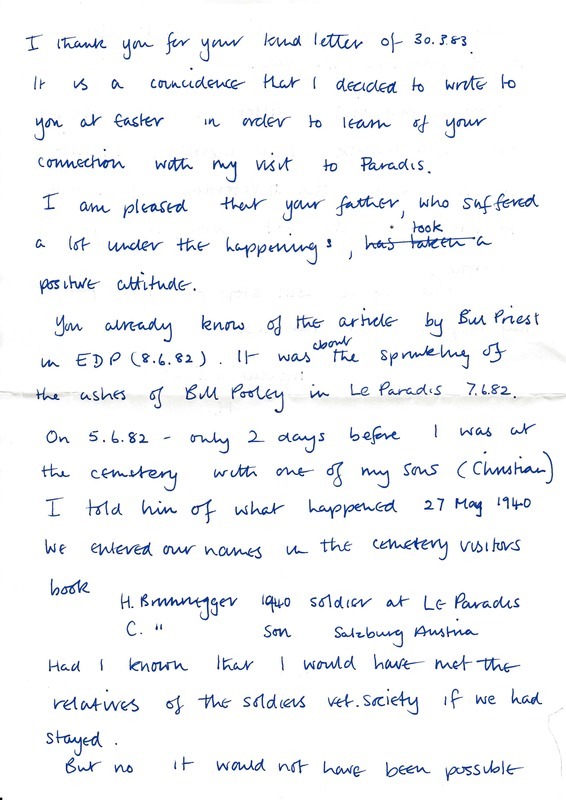 He expressed a wish to return to Le Paradis after the war to attend one of the village's annual commemoration services - something that didn't sit easily with some members of either the Norfolk Regiment or the Dunkirk Veterans' Association. He hadn't had any direct connection with the massacre but felt considerable remorse. Herbert Brunnegger died in 2002. He wrote a number of books including: "Saat in den Sturm: Ein Soldat der Waffen SS Berichtet" - "Seed in the Storm: A Soldier of the Waffen SS."